My middle child came downstairs yesterday and asked me if there was something she could organize for me. This may seem a rather strange request from a teenager, but for my daughter the question is one I associate with her either being stressed or wanting to procrastinate. Those are the only two times she gets into what my husband and I term her “organizing frenzy”. Given the multitude of ways a teenager could choose to deal with stress or to procrastinate, we are thankful that her method is not only harmless to herself but quite helpful to the rest of the family, and yesterday I got an organized bathroom closet out of the deal! For me, stressing or procrastinating leads to cooking. It used to lead to cooking and eating but as middle age and extra pounds crept up on me, the emotional eating part had to go! This meant the cooking part had to be extra wonderful for dealing with the stress or giving me an excuse to procrastinate. Right now, as a family, there is a lot of uncertainty for every single member of the family and for the family as a whole which can be quite stressful when you are someone who is type A, OCD, and control-freakish. God has been teaching me, though, not only how to wait, but all that waiting has to teach a person, which is good both for my brain and for my emotional well-being. To help wait, though, I need something to do, and creating new recipes has become a welcome respite and oasis in the midst of the the desert of waiting. 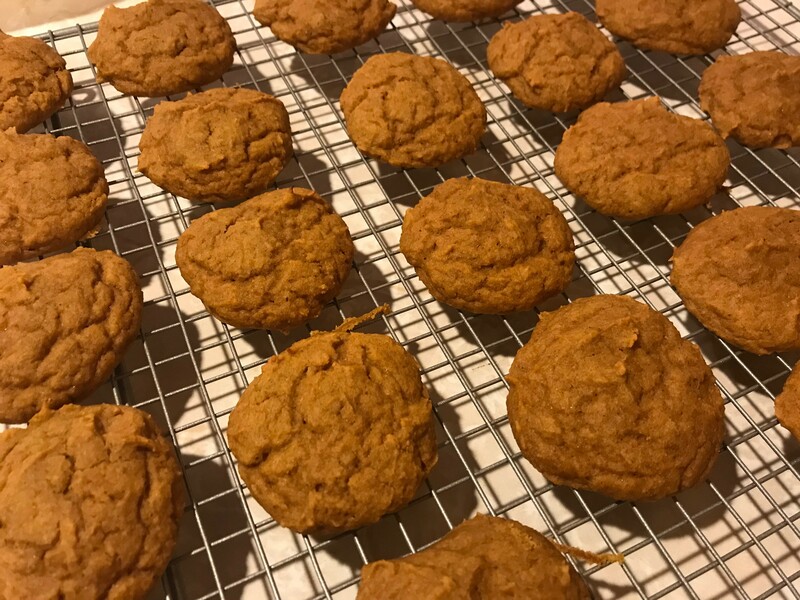 So, last week I created a cookie recipe which I had been wanting to make for a long while… pumpkin melts. I have always been disappointed by pumpkin cookies which seem to lack flavor and are dense and heavy. I wanted a pumpkin cookie reminiscent of pumpkin pie and which would literally melt in your mouth. When the children tasted these and literally said, “They taste like pumpkin pie and just dissolve in your mouth,” I knew I had hit the mark! And better yet, these cookies are gluten, dairy, nut, peanut, soy, and egg free, too! Preheat the oven to 375 degrees and line cookie sheets with parchment paper. Mix together the flours, egg replacer, baking powder, cinnamon, nutmeg, ginger, and salt. Set aside. Blend together the agave, pumpkin, orange juice, and safflower oil. Add the dry ingredients into the wet and mix until everything is well-blended. Drop the cookie dough by rounded tablespoons onto the prepared cookie sheets, leaving space in between for spreading of the cookies. Allow the cookies to cool on the cookie sheets for a couple of minutes before moving them to a wire cooling rack to completely cool. Be careful to get the spatula completely under the cookie when transferring the cookie because they will still be very soft until they cool completely. To store leftover cookies, layer them in a container with parchment paper and put them into the fridge. Because they have the pumpkin and no preservatives, they won’t last as long if left out on the counter.